Click on the title of any website to have it open in another browser window. The vast majority of email correspondence that arrives at Jetex.org asks the question Where can I get an original Jetex motor just like the one I had all those years ago?. Note that Jetex motors have not been made for more than forty years. Also, the popular one shot  Rapier motors can be hard to find as Dr Zigmund (their manufacturer) is not a large operation and legislation about their shipment can change. A search using the keyword jetex is a good starting place  but ignore Jetex exhaust for cars! Various vintage Jetex motors and accessories appear from time to time, and can be purchased with care. Contact Jetex.org if in doubt as motors can be offered with the wrong fuel and fuse in particular can be of dubious quality. 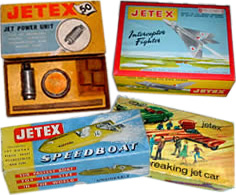 Vintage and new Jetex kits are more often up for auction. Take care not to over-bid! 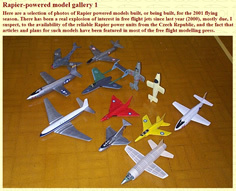 Another UK source for the free flight modeller. 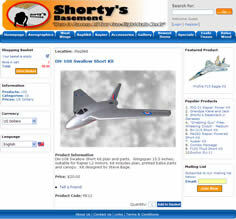 Mike has a wonderful range of items, including the Australian Pel-Aero line of balsa gliders that can adapted to rocket power.